Leverage the speed and reliability of the Wireless-N network standard with the LAPN300 Wireless-N300 Access Point from Linksys. With this single band access point operates on the 2.4 GHz frequency offering a maximum data throughput of up to 300 Mbps. 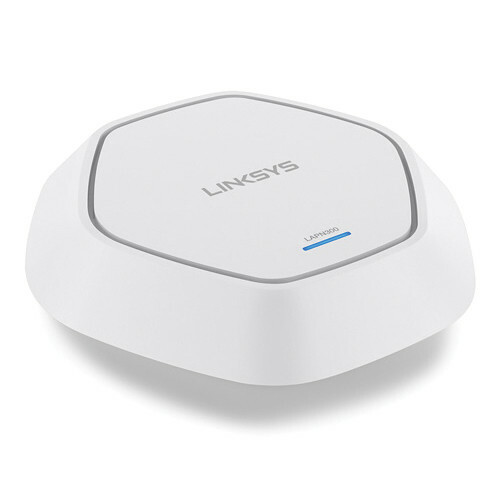 Along with the 2.4 GHz operating frequency, this Linksys access point is compatible with 802.11b/g network standards ensuring nearly any Wi-Fi compatible device will be able to connect to it. With integrated Power over Ethernet (PoE) connectivity you can eliminate the need for additional power adapters allowing this access point to be installed nearly anywhere. Additional features include an integrated Gigabit Ethernet port, workgroup bridge mode for range extension, advanced network security options, IPv6 support, and much more. The Linksys Wireless-N Access Point connects notebooks, smartphones, tablets, and other Wi-Fi devices at transfer rates up to 300 Mbps for an optimal business network experience. With a Gigabit Ethernet port, wireless clients can enjoy the enhanced data speeds by maximizing wireless-to-wired performance. Box Dimensions (LxWxH) 13.2 x 10.5 x 2.6"
LAPN300 Wireless-N300 Access Point is rated 4.0 out of 5 by 4. Rated 4 out of 5 by Lucas O from Cheap and easy to setup Bought this well over a year ago now. POE and multiple vlans makes it great for home usage while keeping guests away from your internal network. Would be nicer if it had have been smaller and more compact. Rated 5 out of 5 by jman42 from Good coverage in a large space I bought two of these to install in a church. We get a good 100-150 feet of range with good signal strength from each one. Installation was smooth and we haven't had any issues. I'm using a gigabit switch with PoE made by another manufacturer, and it's working fine. Rated 4 out of 5 by WJC Org from Not long range So far so good, but it does not provide wifi at a long distance. It will do for now. Does it come with standard power adapter? The Linksys LAPN300 comes included with a AC Power Adapter.